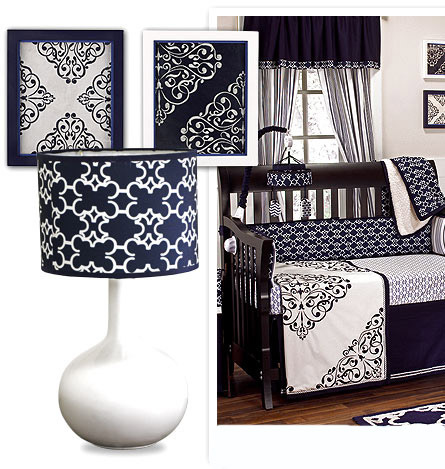 The Harper Nursery Bedding Collection is stunning it presents a crisp, bold yet classic color combination of navy and white featuring beautiful prints and textured fabrics that are embellished with detailed scroll embroidery and chain trim. The Harper Crib bedding collection will create a beautiful nursery bringing the delight of warm breeze and the calmness of gentle waves into the baby’s room. Coordinated nursery bedding accessories available: Fitted Sheet, Window Valance, Musical Mobile, Drapes, Pillow, Hamper, Blanket, Rug, Lamp Base & Shade, Wall Art, and Picture Frames. Wall Sconces are small, individually contained lighting fixtures that are mounted high on a wall to provide accent lighting and dynamic visuals when decorating a room in a home. They cast lovely shadows and pools of light that enhance any space. Wall Sconces are often found in living rooms, dining rooms, and stairwells, to add sophistication and outline the room, and they can also be used to great effect in bedrooms and nurseries. Wall Sconces are not usually the only lighting for a room, but they are a great way to open up a space by lighting the perimeter. Placed high on a wall, they draw the eye to the edge of the space, outlining the room and giving a pleasing accent glow. A wall sconce is usually installed into the wall and is often attached to a dimmer switch, which provides ample mood lighting for many situations. Aside from creating the illusion of space, a wall sconce can actually save space since it doesn’t take up room on the floor or a table or nightstand. If the wiring is intalled into the walls, there won’t even be any cords for your children to get tangled in! Wall Sconces can repeat and highlight other details in the decor, such as scrolling in a headboard or crystal pendants on a lampshade. They work well as stand-alone art pieces, or to accentuate paintings or clustered wall art. Use two to accent a vanity mirror, or to either side of a bed. The design options are endless, and the addition of a Wall Sconce can only enhance your decor! Royal Bambino carries many beautiful options in Wall Sconces. We feature sconces with shades, sconces that mimic candles with their open bulbs, sconces with crystal pendants, and more. Use our Wall Sconces to add glamour, warmth, and visual appeal to your child’s bedroom or nursery – or any other room in your home! Having a baby is a miraculous and special time in your life, but of course it can also be a hectic time. Take the opportunity to lean on your friends, family, and community for their help and support for your new role in life by creating a Baby Gift Registry online at RoyalBambino.com! Simply click on “Gift Registry” at the top of the page, enter your information, and start choosing the unique and high-quality baby products that you desire! Send email notifications to your friends and family to direct them to your online Baby Gift Registry. They can even ship directly to your home! It couldn’t be easier to get the perfect gift from distant relatives. They never have to see your nursery to purchase coordinating products with your Baby Gift Registry! Your Baby Gift Registry can let your friends and family know your theme, chosen colors, or favorite brands for your baby. Add the perfect crib bedding, matching wall art, and coordinating hamper. Don’t neglect those larger items – Grandma may surprise you with your perfect new glider chair! We all love to open a gift and see something we really wanted, not simply something we need. A Baby Gift Registry can be an easy way for you to get exactly what you want for your new baby. And don’t forget to include gifts for Mom and Dad – we carry nursing covers, beautiful and practical diaper bags, and some of the best strollers around. So go online to RoyalBambino.com or come on in to create your Baby Gift Registry today! Lighting options for your child’s bedroom are endless! To illuminate all areas evenly and infuse your child’s room with a warm brilliant glow, a layered approach to lights is the best. Table Lamps, Floor Lamps, or Wall Sconces light an entire space, and Chandeliers provide overhead lighting with a touch of class! RoyalBambino.com offers many solutions to your children’s lighting needs! We carry many classic and timeless designs as well as whimsical and enchanting pieces that will delight both your kids and yourself. Use lights to enhance the decor, express your child’s personality, and add ambiance and wonder to the room where they spend most of their time. Follow Royal Bambino on the Web! Royal Bambino is your premier baby furniture retailer, offering unique and high-quality children’s furniture, bedding, and room decor! Now follow us online for up-to-date information on sales and special promotions, new products, and more! We would love to hear from you! And of course remember to check this space frequently! We’ll be providing ideas, suggestions, reviews, and more here on the Royal Bambino Blog. Shop for Quality Baby Nursery Furniture in California, including Baby Cribs, Changing Tables, Dressers, Armoires, Cradles, Round Cribs, Iron Cribs & Nursery Gliders From Leading Manufacturers only at Royal Bambino. Shop online for a great selection of Little Castle Gliders & Angel Song Chairs. We feature Baby Furniture from leading manufacturers: Baby Appleseed Baby Furniture, Bratt Decor, Bonavita Baby Furniture, Million Dollar Baby, Ragazzi Baby Furniture, and Young America by Stanley.